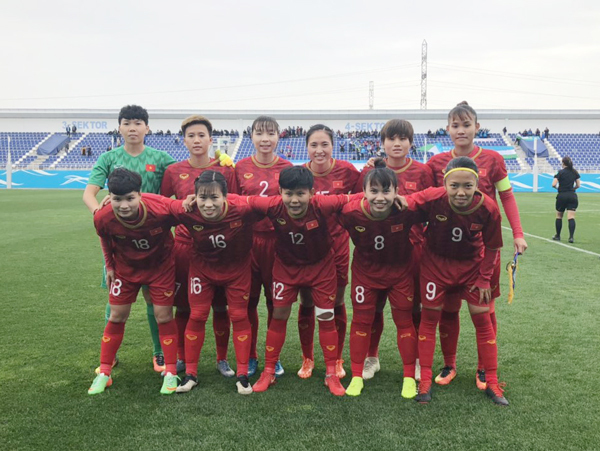 The Vietnamese women’s football team got off to a good start in the second round of the 2020 Tokyo Olympic Asian qualifiers, as goals from Tuyet Dung and Huynh Nhu helped Mai Duc Chung’s side edge past hosts Uzbekistan 2-1 in their Group B opener at Lokomotiv Stadium, in Tashkent, on April 3. Vietnam dominated from the outset, taking the lead in the seventh minute, with experienced forward Huynh Nhu having opened the scoring by converting a right-wing pass from Tuyet Dung. However, the guests’ lead was short-lived, because only two minutes later, Kuchkarova Ugiloy made use of Vietnamese players’ distraction to steal the ball and restore parity for the home side in a fast counterattack. Inspired by the equaliser, Uzbekistan put up their pressure and forced the Vietnamese backline to work hard in resistance. Failing to find the net despite constant attacks, the Uzbek players paid dearly, as Vietnam reclaimed their advantage three minutes after the hour mark. In a fast counterattack, Mai Duc Chung’s side was awarded a penalty following an Uzbek foul in the box and forward Tuyet Dung made no mistake converting it into a second goal for the Vietnamese team. The remaining minutes saw Uzbekistan pushing back for an equaliser, while Vietnam failed to capitalise on a number of chances to extend their lead. The 2-1 score remained unchanged until the final whistle. In another Group B match the same day, Hong Kong (China) and Jordan played out a goalless draw, which also meant that Vietnam temporarily led the standings after the first match day with three points. Next up for Mai Duc Chung’s troops will be a second group match against Hong Kong (China) at Transportation Institute Stadium on April 6.